"ESSENCE" is Renee' Michele's 4th solo piano album. It is beautiful calming music that will take your breath away. 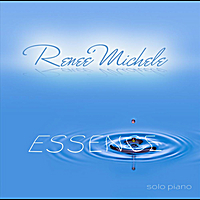 "Essence" is the fourth solo piano release from Renee’ Michele and her best album yet! Lyrical, graceful, and effortlessly flowing, Renee’ Michele’s music is a tribute to the human spirit as well as to the individual people and experiences that directly inspired the music. I have enjoyed all of Renee’s albums over the past eight years, but "Essence" is truly exceptional in its emotional depth and musical truth. In addition to being an outstanding pianist/composer, Renee’ Michele is an Occupational Therapist and a piano teacher for children with special needs and developmental challenges. She and I had dinner one evening a few years ago, and listening to her talk about her students and the difference she has been able to make in their lives was a profound inspiration that I will never forget. That generosity of spirit comes through the music like open arms, welcoming and accepting, ready to share. Renee’ Michele’s classical roots are apparent in the depth of her music, but her style is contemporary and smooth, immediately accessible with new layers unfolding with each listen. "Essence" begins with “Believe,” a slow, uncomplicated piece of uncommon elegance and grace - a wonderful way to start! “Yearning” reminds me of sitting in front of a window and letting my mind wander - daydreaming without trying to control thoughts or impressions - leisurely, easy, and healing. “Another Time” also has a very dreamy, peaceful flow that soothes and comforts. “Greensleeves” is a fascinating arrangement of this ancient song. It begins with dark, bold chords that lead into the melody which then weaves in and out of improvisations on the theme, creating something new out of something very old. “The Gift” returns to gentle grace and tenderness tinged with passion. The title track is a favorite and a piece that would work wonderfully in a poignant film soundtrack. Gentle and delicate yet strong and resilient, it goes deep within the human spirit to find its “essence.” “Wow!” about sums it up. I also really love the closing track, “Stillness,” which says so much so simply and elegantly. Renee’ Michele has created a real masterpiece with "Essence," and I hope it will give her music the exposure it so well deserves. Highly recommended!